The larvae of this species feed on larvae of the green tree ant, Oecophylla smaragdina. 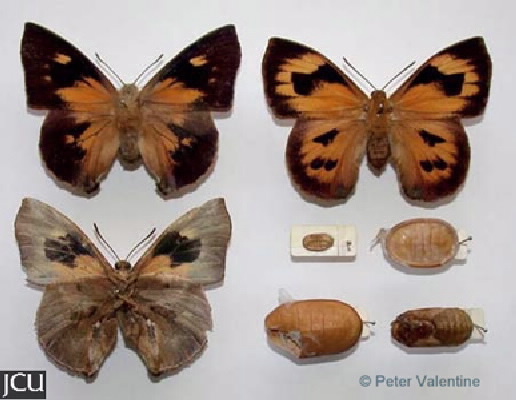 Mature larvae are flattened, oval in shape, shiny orange to reddish-brown; head cream. Tough leathery skin prevents them being attacked. Adult fore wing basal orange with outer portion dark brown enclosing orange spots; hind wing has an orange basal area and dark bands near outer margin, also some dark spots; lower surface basically grey-brown, fore wing with basal orange area with a dark brown median band.